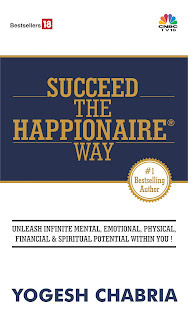 Yogesh Chabria - The Happionaire ​Blog - Best Motivational Speakers In India - Inspiration, Success: Are You Jealous? Several times, I see people feeling jealous of others. When they see someone driving in a nice car or enjoying the good life, they instantly feel jealous, they start telling everyone how the money was made through 'unethical' means or how that person simply made it because of 'good' contacts. They are filled with jealousy and burn from inside. Almost always such people never succeed, the never go on to create wealth and even more importantly these people never have inner peace, happiness and love. In this lovely journey called life, jealousy is something that burns people from inside - get rid of it and convert it into inspiration. Wealth is something beautiful and I feel very happy when I see someone enjoying it. That person is enjoying it because of hard work, intelligence, creativity or probably even because of sheer luck. He or she is an inspiration for me. The other day I was visiting Palladium, Lower Parel (Remember I had shared all about it in Invest The Happionaire Way , it is the same place where I had visited Big Bazaar when Lower Parel was just coming up and how it was an excellent real estate opportunity) I was speaking to the lift attendant, and within the few minutes I was in the lift with him, he shared so much information about the mall and how it ran, I will share these insights in the near future. I love the way we get insights about the way the world works from the most unexpected of people. I loved his attitude - he had no jealousy or envy and knew about the new Shangri La Hotel that came up, the land costs in the area, the stores that were doing maximum business and they profile of buyers. People who are jealous send negative energy, they fill their heart with jealousy which in turn becomes anger. Jealousy stops people from being inspired and learning, it stops them from realizing we are all creations of one Invisible Divine Force. This Force is what blesses us, it is this Force that helps up move ahead and come out of the most challenging of times. Today in our life when we look back, I am sure all of us will remember moments where we were faced with difficulty, times when we thought that everything has ended, times when there was no hope - and then suddenly this Divine Force suddenly gave us energy and today we are have risen stronger. Jealously makes sure this Force doesn't work for you. This Force doesn't like jealousy, it doesn't like the hatred, it is repelled by it. Instead let us all fill our hearts with love, love for this wonderful thing called life. A lot of fellow Happionaires have been asking me what all I have been upto, well for one, I have been writing something - it is a Business Thriller - to me it is one of the most exciting journey's I have had. It is as if I have travelled with the characters of my story into the business world. I have almost finished it. I still haven't sent it any publishers, except one. The one publisher I did share it with, refused to publish it due the apparent controversial nature of the book. Very understandable, but it is a story I want the world to know. Shall share more on it soon. You should not disappear from writing blog for months. When are you going share more about the Chameleon way. Lovely thoughts, I wish more people thought this way. If people around us are happy and wealthy, it shall rub on us too. Yogesh ji, I want to know what your new Business Thriller is about? It sounds very interesting and looking forward to read it, and as Dp said please don't disappear, we miss you when you are not here. Publisher will not be a problem for you - just dont compromise on the content of your book - we dont want you to bulge in country where we are supposed to have freedom of speech and expression. We can wait until a publisher finds you. Truth flows effortlessly from your pen - just keep doing wha tyou are doing ! You call it jealousy but most wealthy people have this character in them. People do amass wealth by unethical means it is true about most of the successful people in world and it is even more true in India and today's world order ensure this system that's why the world is in trouble these days. Coming generations will pay price for this. All the people can not enjoy the lifestyle you have mentioned in your email article such a greedy behavior can not be the inspiration for all. World is suffering from the greedy behavior of the successful people. Companies are making tons of profit workers are working on low wages contractors are making money. Educational institutions and hospitals are working under private managements and treating the students and patients as consumers only to make more profits is it life you are saying beautiful, you may say because you are wealthy and successful. Thanks to you for writing such post. It is as always a humbling experience reading your writings. I am more than curious about your business thriller. Please share the details whenever it out and available to all of us. "Shall share more on it soon" means it will never be shared. That's what happened about details on Gold, Chameleon, opportunities in a very different sector away from the stock markets and many more. These days you seem to be posting blogs only when your book nears completion. his wealth to society and supporting causes that help others. all of you read The Business Thriller. 1. You told us that you will tell more about Chameleon's STRATEGY. It has been around 3 years. Please let us know the answer of two questions written above. Very inspiring reading, there are lots of jealousey here in Sweden, it is part of the culture that everybody shall have the same of everything.